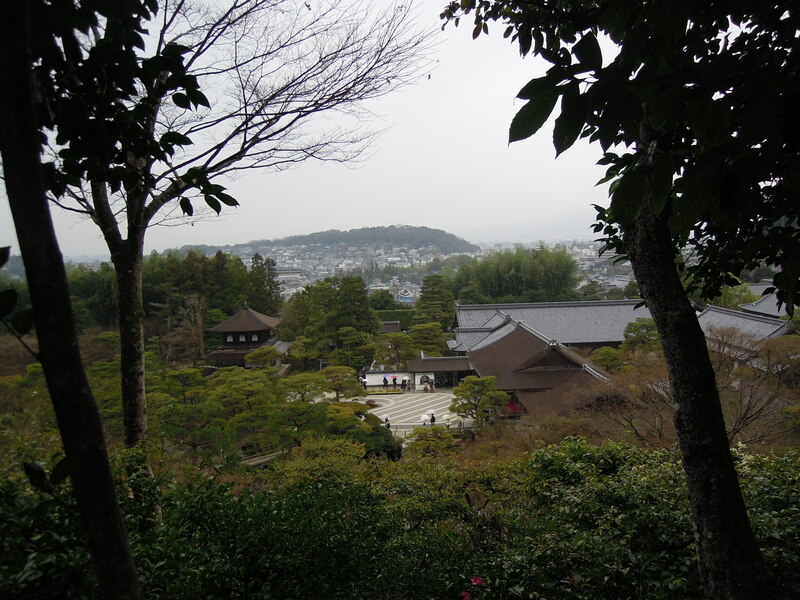 As I’ve noted before, there are more than a thousand temples and shrines scattered throughout Kyoto. Before we came here, I didn’t think I’d be interested in visiting very many of them, but I’ve changed my mind on that. Each one is a little world unto itself. 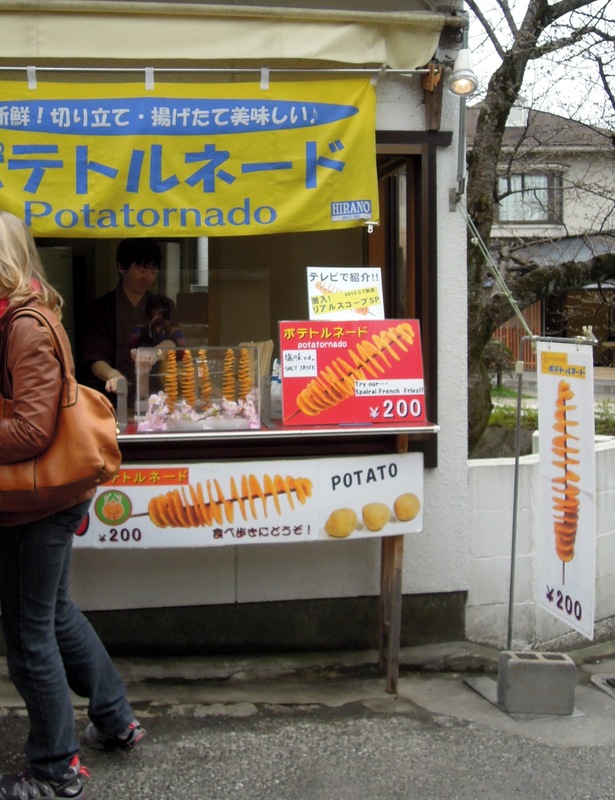 And since they are all over the city, they make Kyoto feel like a collection of small worlds, all self-contained yet still part of the community. Some of them are extensive, world-famous complexes that draw many tourists every day. Others are tucked into residential neighborhoods, apparently visited only by locals and those of us travelers lucky enough to happen upon them. I have so many photos for this post, I’m grouping them into galleries. To inspect any individual photo at closer quarters, click an image and a manual slideshow will pop up. On the circular galleries, clicking will also bring up the photo caption, if there is one. 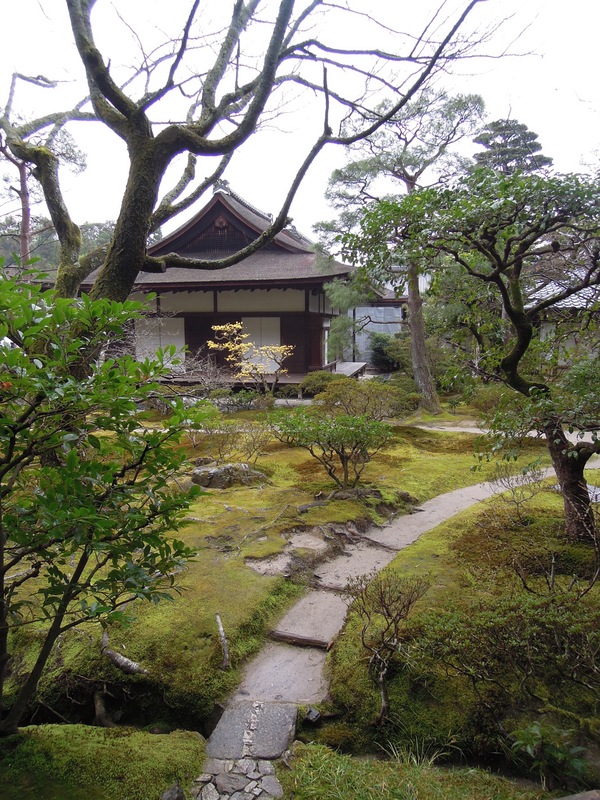 Ginkaku-ji (Silver Pavilion) is one of the best-known temples in the city. 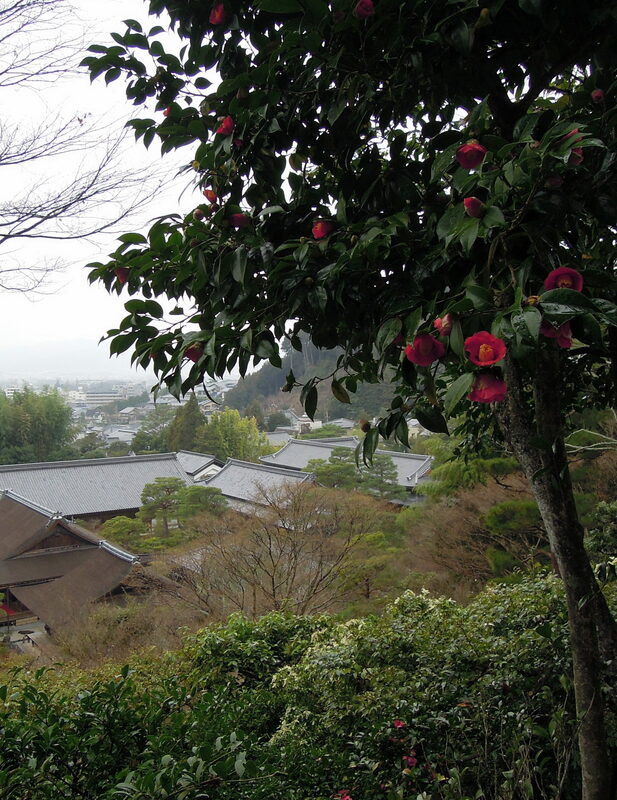 It has an impressive Zen sand garden and a lovely walking path that goes up the hill behind the buildings. Like Kiyomizu-dera, which we visited a couple of weeks ago, Ginkaku-ji is a major tourist attraction and as such, the streets around it are bustling and lined with food stalls and souvenir shops. I shared a sketch from Ginkaku-ji in yesterday’s post. 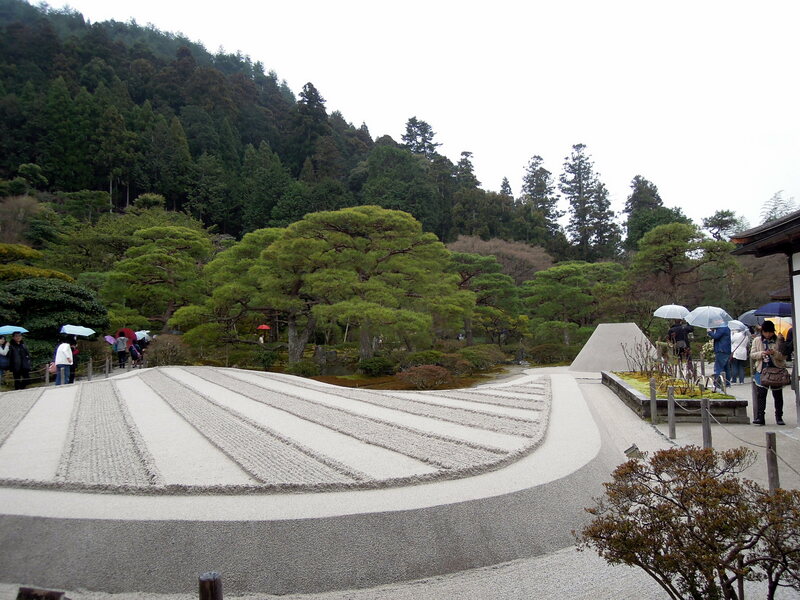 Sand garden at Ginkaku-ji, with cone in background. 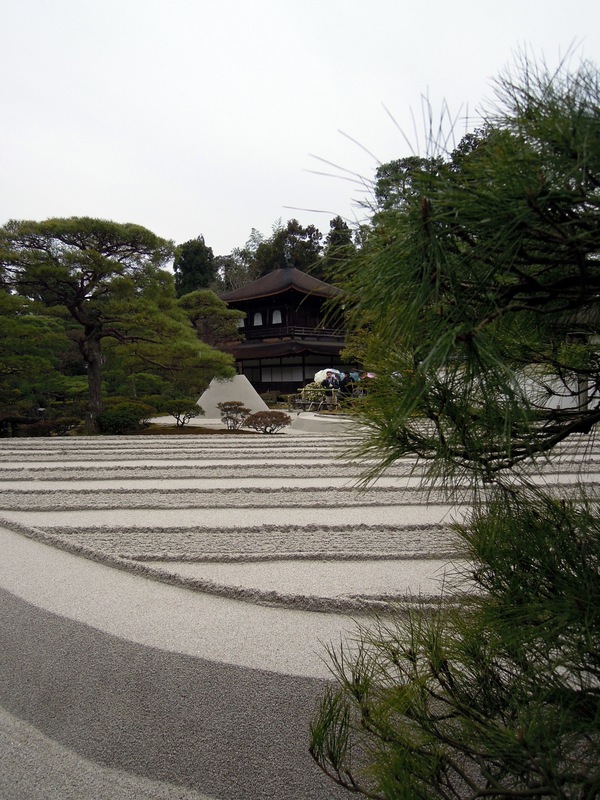 Another shot of the sand garden at Ginkaku-ji, with cone in background. How do they do that cone?! This temple is extremely popular and was pretty busy when we visited, even though it was raining. View from the hill path behind the temple buildings. 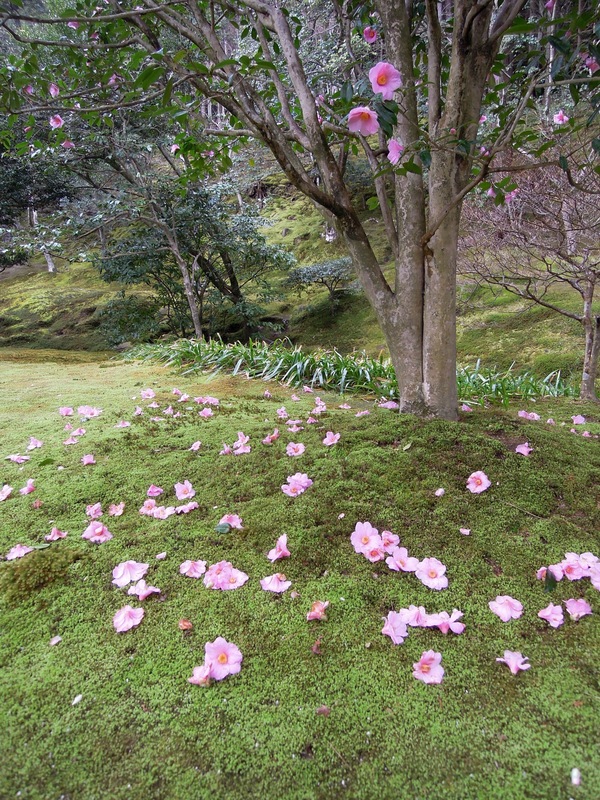 Fallen camellias. Erik and I joked that monks come out at night and carefully position each flower. Don’t they look perfect?! 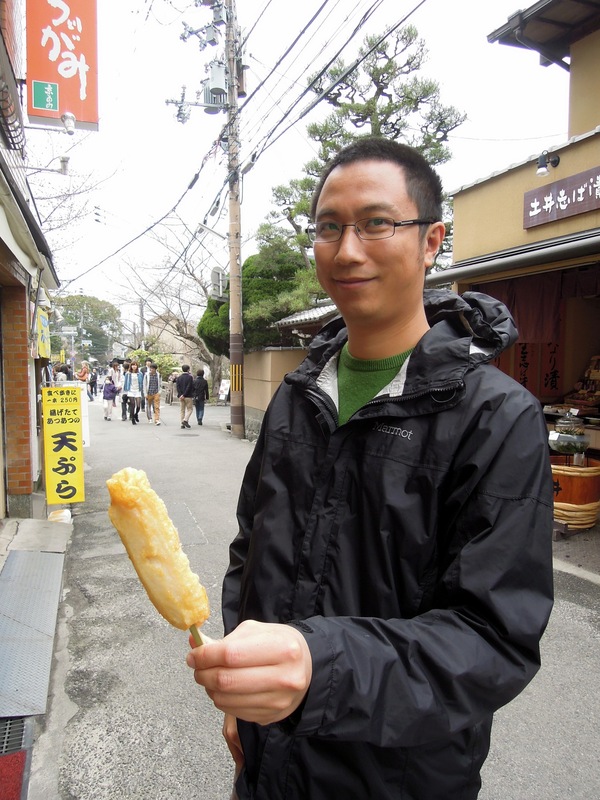 Our new favorite snack: fishcake on a stick! 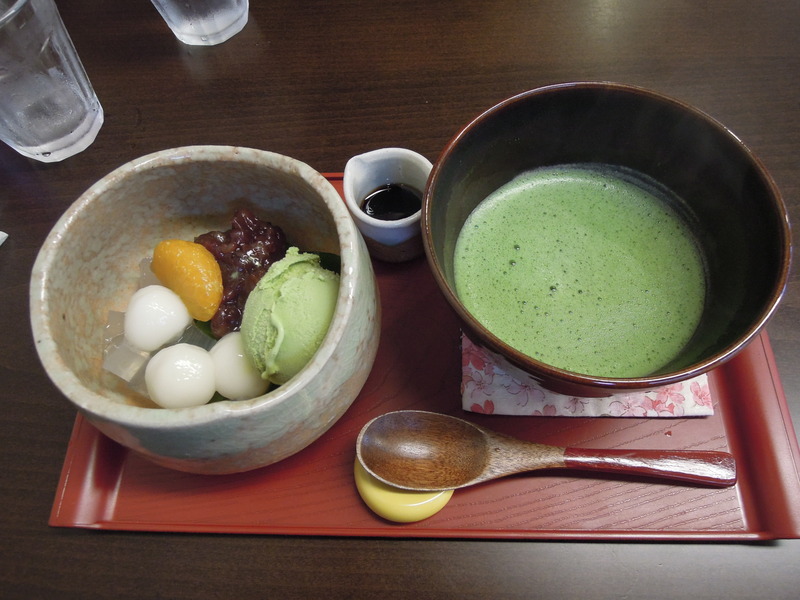 Matcha and sweets in a cafe near Ginkaku-ji. 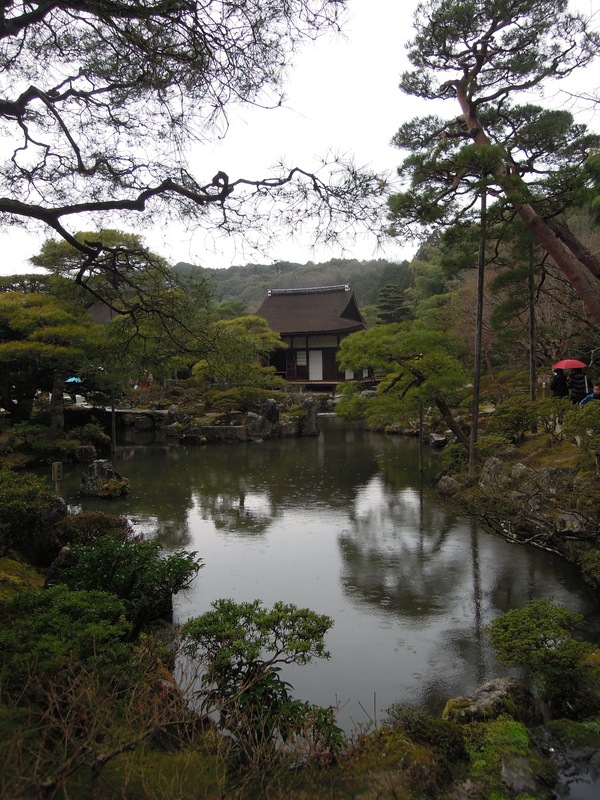 Not to be confused with Ginkaku-ji, Kinkaku-ji (Golden Pavilion) is another of Kyoto’s famous temples. It is best known for the gold-leafed pavilion which gives the temple its nickname; however, locals I spoke to thought the pavilion a bit showy. It is set at the edge of a magnificent reflecting pond with little tree-dotted islands in it (they reminded me of Loch Eilt). For weeks I’d been looking at photos and postcards of this vista, but I still gasped when I saw it in person. We decided to be properly touristy at Kinkaku-ji, taking refreshment at the tea shop on the grounds and buying a fortune from a machine. Peaceful setting, hordes of tourists. 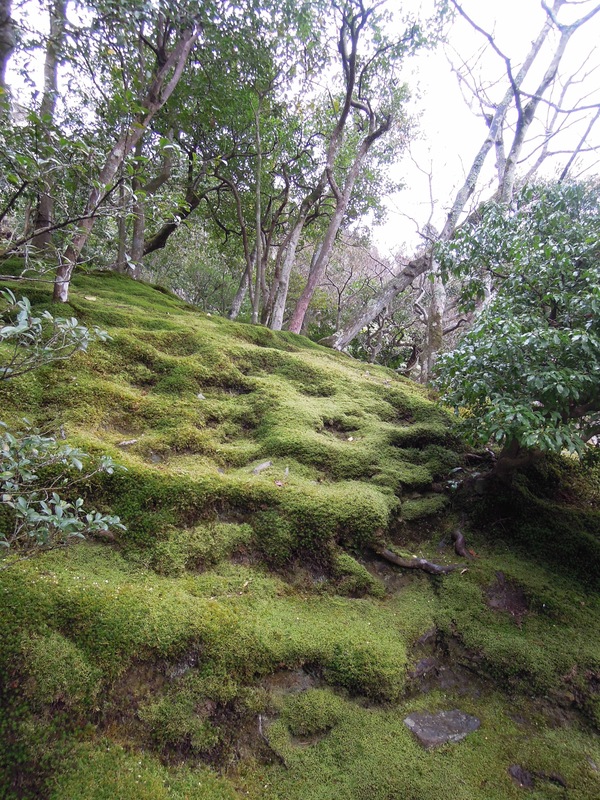 The enchanting little trails off the main path were, alas, all closed to the public. I’m not sure what the coin-toss spots are all about, but I’d guess good luck. Another coin toss spot. I wasted a ¥50 coin on this one, but my aim was (as usual) horrible. Outside the tea shop. There was also a tatami room, but everyone opted to sit outside. Tea cake. Sugary on the outside with sweetened red bean filling. I guess the gold leaf is in keeping with the golden theme; one of the vendors was also selling tea with little gold flecks in it. There’s my fate awaiting me in the little slot. This one we visited by accident, on our way from Gion (the famous geisha district) to Maruyama Park in search of cherry blossoms. I kept getting distracted by the shops in Gion, so by the time we reached the shrine and the park, the sun had set. We walked around the park for a bit, then exited through the shrine. I loved the lit-up lanterns. About a dozen food vendors had set up shop near the main gate; on our way out we bought two treats on sticks: grilled beef cubes in a savory sauce, and some sort of okonomiyaki crêpe, both delicious. Entering Maruyama Park via the shrine. I see these folded papers at many of the shrines. They remind me of Spirited Away. We walked through this shrine on our first weekend in Kyoto, when we saw the ume in full bloom. It’s a beautiful shrine, but I returned this time for the monthly flea market, always held on the 25th. There were booths and blankets set out on the streets all around the shrine, and vendors selling everything under the sun. I had thought I might pick up some kimono fabric scraps, or even a kimono — there must have been thousands available, both secondhand and new. At one booth there were pretty secondhand kimono going for ¥500 apiece (just over US $5); at another large and very busy booth, you could buy a plastic bag for ¥1500 or 4000 (depending on size), and fill it with as many kimono as would fit. 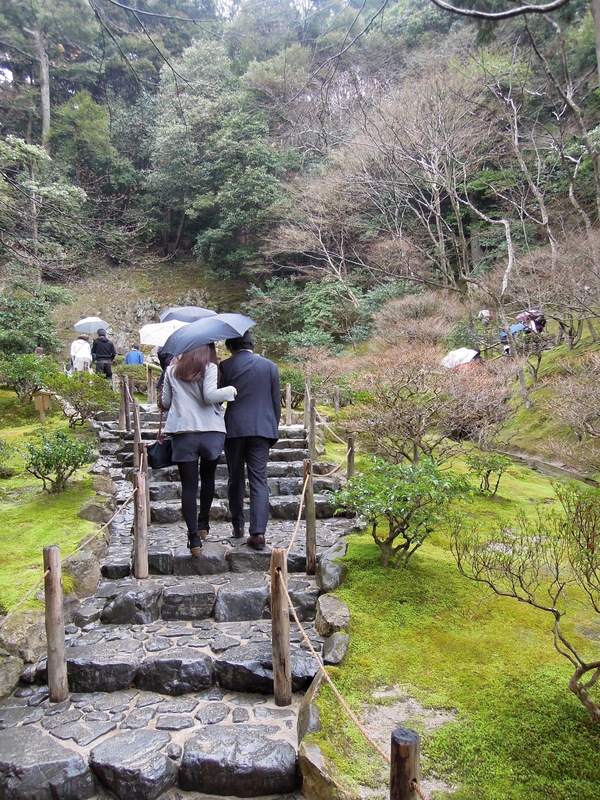 If we were going straight home from Kyoto I would probably have filled an extra suitcase! But instead I ended up buying two handmade, hand-dyed slouchy hats from a very nice woman who also gave me a postcard and a face cloth as a thanks for my purchase. “Welcome to Kyoto,” she said. 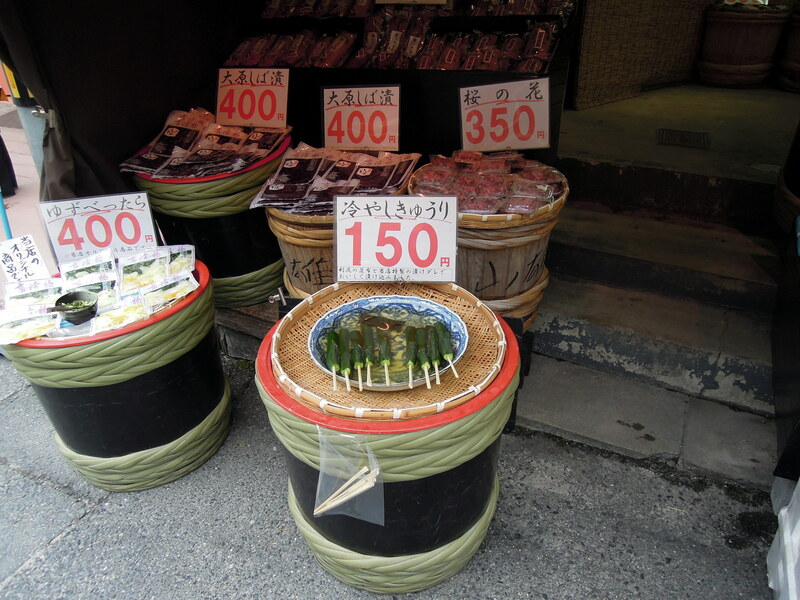 I saw more non-Asian people at this market than I’ve seen anywhere in Kyoto. I wonder where they hide themselves the rest of the time! As a pair of middle-aged women passed me I heard one murmur to her companion, “Well, I’ve hit saturation point.” Truth. I was going to pick up some food at one of the vendors but by the time I finished browsing I was too overwhelmed to even consider it. I ended up catching a bus for home, sitting for a few minutes at the foot of Funaoka-yama, and then relaxing with a good lunch and my journal at Sarasa (if I really lived in Kyoto I’d be a regular at that cafe!). I’d say the market was about 65% antiques or secondhand, 20% food, and 15% handmade. This vendor had pretty handmade hair ornaments for sale. 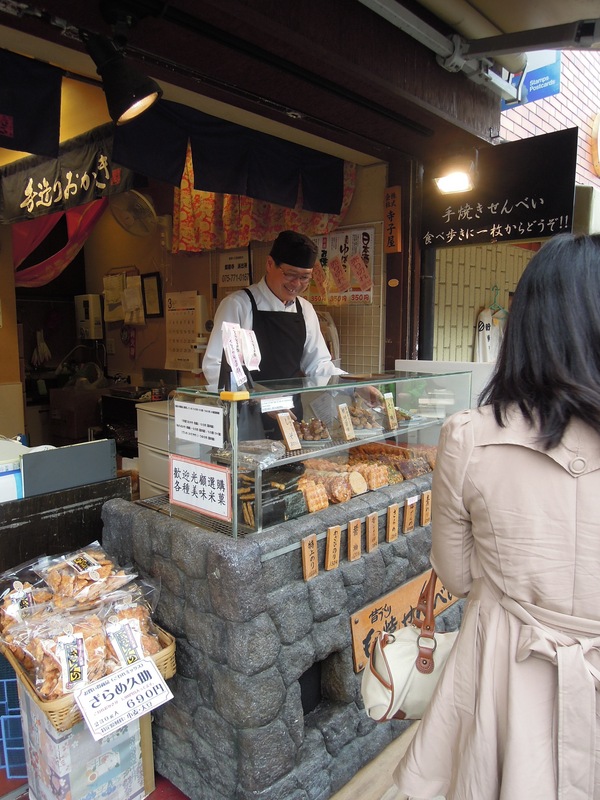 All the dried-fruit vendors had samples. I tasted sugared mango, dried fig, and candied ginger. I think there were fabrics in these paper wrappings. I didn’t look because I figured anything wrapped so securely was out of my price range! I was charmed by these wooden boxes and wished I had room in my luggage for one (or several). Not sure what these are, but the kanji says pork. Clever way to sell knives: have a cabbage on hand for demonstrations! In one of my new hats. Ryōan-ji is in the western part of Kyoto, just a short bus ride from Kinkaku-ji. According to Wikipedia, the name means “The Temple of the Dragon at Peace.” Isn’t that cool? 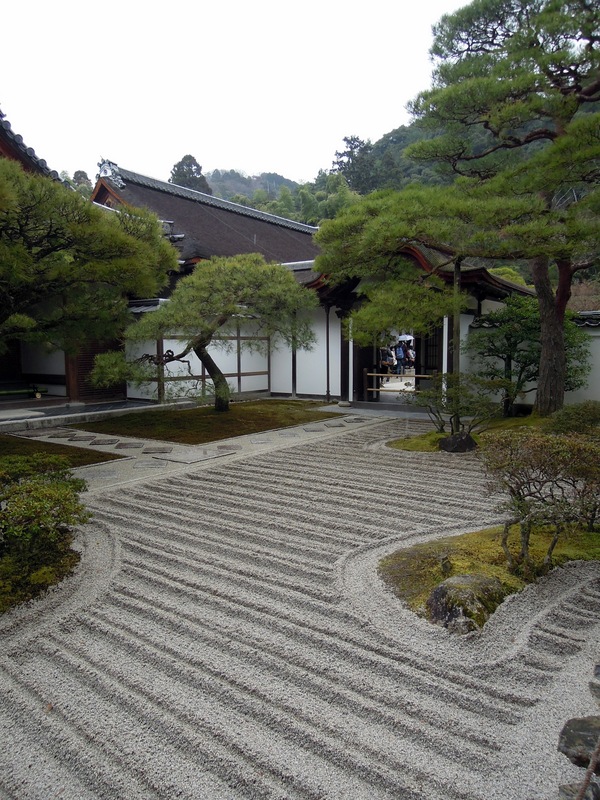 The temple is a UNESCO Heritage Site and home to the most famous Zen rock garden in the city. You view the garden from a raised wooden platform, an extension of the building behind. Although there’s a buffer pavement between the garden and the platform, there are signs indicating that it is not permitted to step down. At one point while sketching, one of my pens fell from my purse and skittered across the pavement to land just outside the raked gravel. I momentarily stopped breathing and it felt as if everyone else did too. The guy next to me moved reflexively to pick it up, but then froze, turning his head toward the “do not step down” sign. I felt compelled to turn my gaze toward it too. Then the guy decided he might as well go for it, and stepped quickly down to retrieve the marker and return it to me. I said “Arigatogozaimasu,” he nodded almost perfunctorily, and then moments later reseated himself at a new spot several feet away from me. I felt that he had decided I was a danger! Anyway, I was very grateful that he had done the deed for me — being a foreigner makes me ultra-conscious of any type of transgression, however small. After I finished my sketches, I walked through the gift shop area and was interested to note several other artistic depictions of the garden. The rest of the temple grounds, while less famous than the rock garden, is nothing to sneeze at either. The temples here have such pretty maps! Watercolor pencil & waterbrush sketch. Yes, the color was really that vivid. A small model of the garden. Inside the building adjoining the rock garden. First sketch, the one my friends liked. I particularly liked the painting on the right. I liked this textile rendition too. Main gate seen from the inside of the complex. The raised walking platforms give a magical feel. Yes, these flowers were really that color!! Returning to the main gate. I enjoyed every bit of this tour. This entire post is a work of art! Oh thank you, Sherry!! I’m glad to hear it. I was puzzling over how to do this post because there are 130 photos in it — far too many for my usual format, but I didn’t think splitting them up into many posts was a good idea either. Fabulous! I’m so enjoying my virtual world tour! So happy to hear it, Stacie! 😀 Kyoto is like Paris in that it is so magical. How did you get those circles?! Your dedication to recording everything meticulously is commendable. Hey my dear, big hugs to you. ❤ ❤ The circles are one of the gallery options — I had no idea these were there until I did this post. In the media section (where you upload pics) you can create a new gallery, and there are different formats for how the gallery will appear. I’m enjoying your posting. I have a question. Do you think the photo on the cover of this book (http://amzn.to/ZSmKyy) is taken from the Ginkaku-ji? Thanks! My guess would be no, because the sand at Ginkaku-ji seems to be raked in wider lines, and I’m not sure there are single rocks like the one on the cover. 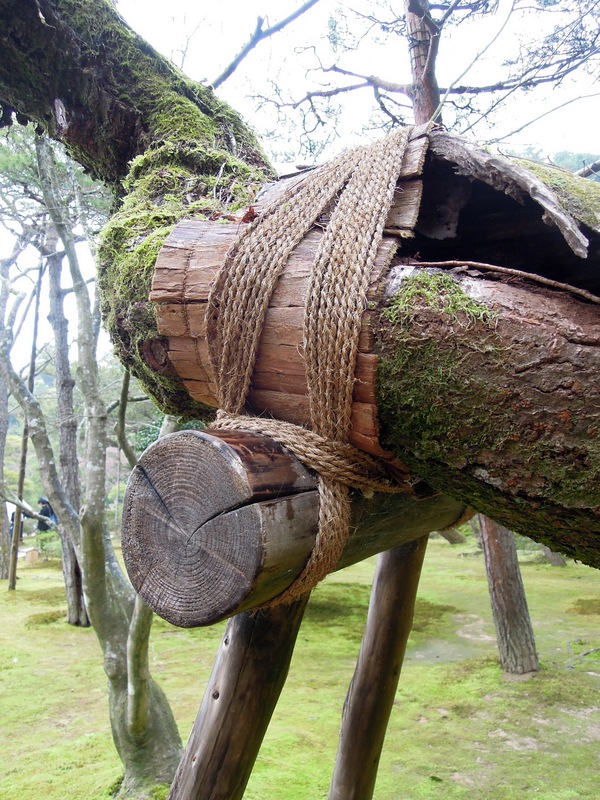 Dear Ms. Hsia: How do you think of the below picture of Ryokan from another temple, 大德寺 in Kyoto? http://bit.ly/1eXCPzz Even though it isn’t identical with the figure appeared in the book cover, I guess the figure is in somewhere the same place to this temple. Hmm.. what a mystical!